We’d love your help. 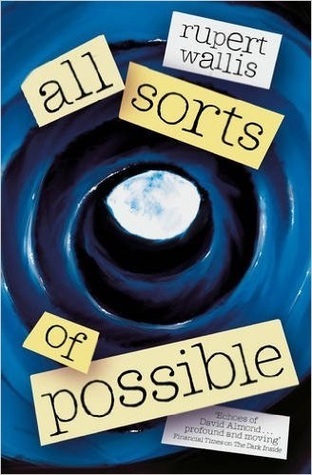 Let us know what’s wrong with this preview of All Sorts of Possible by Rupert Wallis. A hauntingly atmospheric novel from the phenomenally talented Rupert Wallis, perfect for readers of Patrick Ness and David Almond. To ask other readers questions about All Sorts of Possible, please sign up. I can't say t isn't beautifully written because it is but I'm so confused. 150 pages in and I literally do not have a clue what is going on. Moving on. I was so annoyed that I spent time finishing this book by the time I got to the end of it. I felt that it started off really strong, hence why I decided to borrow it from the library. A few chapters in, it seemed to go in a weird direction that I thought strayed too much and didn't feel properly resolved. My doubts weren't settled by the end and like I said, I feel like I wasted time reading it, which is a shame because I really enjoyed the start. It was a complete U-turn for me. Well...it’s the lowest rated book of the year so far, doesn’t that say it all? I appreciate that writers put a lot of work into books and there are always people whom love particular books, but this just didn’t do it for me! I found it really disappointing and the ending was AWFUL! Sorry, but it was BAD! This review first appeared on my blog Bart's Bookshelf. A year or so back I was at a bloggers event at Simon and Schuster, where Robert’s first book, The Dark Inside was among those being launched, and I got to meet Rupert, who was a thoroughly nice chap. The Dark Inside was pretty well received, but unfortunately I never found the time to read it myself, so when I was offered the chance to take part in the the blog tour for the book and receive a review copy of All Sort of Possible, I jumped at This review first appeared on my blog Bart's Bookshelf. A year or so back I was at a bloggers event at Simon and Schuster, where Robert’s first book, The Dark Inside was among those being launched, and I got to meet Rupert, who was a thoroughly nice chap. The Dark Inside was pretty well received, but unfortunately I never found the time to read it myself, so when I was offered the chance to take part in the the blog tour for the book and receive a review copy of All Sort of Possible, I jumped at the chance. The first part of the story deals with the sink-hole and the accident, and is quite dark and frightening as Daniel tries to escape and save both his and his dad’s life. Then while visiting his dad’s bedside, things take a paranormal turn when a stranger turn up, suggesting Daniel might have some special powers, special powers that might be able to save his dad. But when a local gangster Mason, finds out, Daniel finds himself in even more trouble. It the end however, it’s not really a story about the paranormal, gangsters, or sinkholes, but one dealing with worry and grief, finding support in friends, accepting that with good things in life, also comes the bad, and you can’t truly appreciate the former without the latter. Powerful stuff. I really liked both of Daniel’s friends that we meet during the course of the story, Bennett and Rosie, really help so support and possibly more importantly push Daniel when he needs it, and are just what he needs too come to terms with everything. Bennett especially (like all good best friends) seemed to instinctively know when an arm around the shoulder or a kick up the arse was required. This one took a while to read, but it was a nice read. Humble, simple, and full of many life lessons, Wallis was able to accurately show how people and their emotions are changed when they are dealing with loss. At times, I felt that the book fizzled out from the high intensity that it started with, but had it's climatic moments later on when Daniel started to interact with other people like Mason. I would definitely recommend this read to anyone who loves books full of emotion and lessons that This one took a while to read, but it was a nice read. Humble, simple, and full of many life lessons, Wallis was able to accurately show how people and their emotions are changed when they are dealing with loss. I loved The Dark Inside, and this novel is just as good! Rupert is an extremely talented writer - no word too many or too few, and his books just send a shiver down your spine. If you like thought-provoking books and are a fan of Patrick Ness or David Almond, I urge you to try this! Can't wait for a third!!! Ambitious and tackles serious issues but I found the style a bit preachy and quite heavy, with far too many similes! I really enjoyed reading this book, It was very fast paced and would recommend it for anyone who likes an exciting story. It was a really good book, he start wasn't quite what I was expecting but when I got into it I really enjoyed it.